President Larry Roberts called the meeting to order at 6:36 p.m. Directors present for the meeting were Nicole Andress, Christy Astorga, Bonnie Brooks, Errol Daniels, Angela Harris, Dennis Harrison, Stan Lambert, Ty Payne, Larry Roberts, Larry Sassa, Paul Smith, Douglas Tillett, Stuart Toomey, and Jim Van Cleave. Doug Alred, Jane Alred, Susan Haag, Franz Lerch, and Todd O’Donnell were absent. Approval of 2/5/19 (February meeting) minutes: On a motion by Douglas Tillett and seconded by Stan Lambert, the February board meeting minutes were approved as submitted. Treasurer’s Report: Bonnie Brooks distributed copies of the Balance Sheet and the Profit and Loss Detail Statement through March 4, 2019. Line items discussed included income from the Winter Beach Run and the GRR training class. Expenses included payments for the Jan/Feb newsletter, race team entries for Mantanzas 5K race, Facebook ads, and several donations including Friends of the GTM Reserve. Other expenses paid included Jacksonville University Catering Services for the Last Gasp social, which there is still an outstanding check payable to them, and Smoak, Davis, & Nixon for tax consultations and preparation. Bonnie also stated that she would be out of the country for 2 weeks, so if anyone had pressing invoices or financial request, they would need to get them in as soon as possible or wait until she returns. Emerald Trail Plan Update – Larry Roberts reported that there is good news and real progress has been made. Currently there are several meetings and events scheduled in March. There has been a resolution filed with the city to fund the Emerald Trail Plan, for which there is a city council public hearing scheduled for March 12th. Then on March 13th there is a Lunch and Learn session with Kay Ehas of Groundwork Jacksonville. Also, on Monday, March 18th, there are 2 city council committee meetings in which they will review and vote on the plans, as the plans will go before the full committee on March 26th. The Capital Improvement Plan includes the 1-mile demonstration/”First Mile”, in which Groundworks raises $900,000 and the City of Jacksonville pledges $2.7 million. 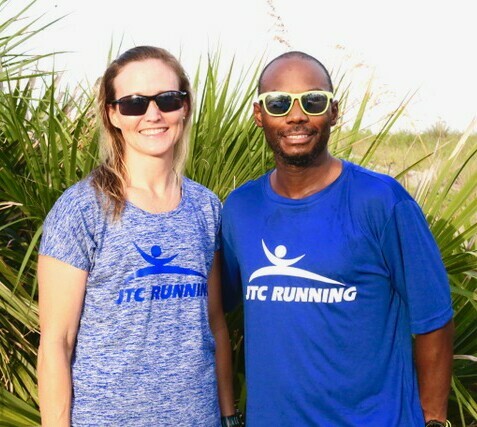 Where to Run in Jacksonville on JTCRunning.com – Paul Smith reported that he is making progress with the list and would send copies via email soon. Currently working on the links that would include images with descriptions of the routes, in terms of their accessibility and terrain. This would give runners a better idea which routes to select based on traffic, heavily shaded routes, bridges, and other factors. Also considering adding contact names for specific runs and routes, which would be helpful for those unfamiliar with the locations and/or new to the area. Again, one of the goals is for it to be a comprehensive list of routes that will be easily accessible to our website viewers. Sulzbacher Run, Jump, Throw – Angela Harris reported that there was not any new news, however she is still reaching out and following up with Maxine Ingram and the Sulzbacher Center. Gate River Run Training Class – Larry reported that there were 114 paid participants enrolled in the class and there were 26 group pace leaders. They ran their last long run last Saturday and we have pictures on our Facebook page. We have received good feedback regarding the overall class in terms of the coach, support from each other, and the benefits from joining the class. This has been our biggest Gate training class since 2013. Track Meet Timing – Larry reported that the club was recently sent a new contract which included price increases for the track meet timing events. The price was previously $700 a meet, which has been increased to $825. With the price increase they will be able provide printed results as well as various data on participants, which will also be useful in analyzing the numbers and stats for future planning. JTC Running Promotional Video – Larry Sassa reported that Creative Solutions, who we originally approached to create our video, has been replaced by Channel 4, which has experience with creating videos plus familiarity with JTCRunning and our events. They will be around taking video footage at the Gate River Run, the expo, and may also be at the hospitality tent conducting interviews with members. Colleen Clarson will assist with the video and serve as a liaison. Channel 4 and Cole Pepper will also assist in obtaining archived footage as they currently have an in-house production group that has access to the videos and news materials. The goal is a 5-minute video by the end of May, and we hope to have a rough cut maybe in April. Club Booth @ Runners Expo & Hospitality Tent – Larry stated that we have the shifts for the booth expo covered with multiple members and board members on each shift and there will be designated shift leaders/captains. We will be handing out wrist bands for the hospitality tent, selling and renewing memberships, as well as selling old merchandise priced at a discounted price of $5-$10. We, however, still need some shifts covered for the hospitality tent for bag check. USATF-FL 15K Championship Donation – Douglas Tillett discussed the club’s involvement with USATF-FL. GRR is the USA 15K Championship and the Florida 15K Championship. He mentioned that we have donated to USATF Florida for at least the past 5 years and believes we should continue to foster that relationship. Douglas made a motion, seconded by Bonnie, that we make a $400 donation to USATF Florida. The motion was passed by the board. Gate River Run (Sat 3/9/19) – Stuart Toomey reported that online registration will be available for another 24 hours and entries were up 11% from last year. He stated that he would be at the fairgrounds Friday afternoon to take care of and set up the tents and JTC arch, as well as arrange for 2 kegs to be delivered. He also mentioned that he would need someone to coordinate the stop watching and elite timing. Jim Van Cleave reported the we have 92 elites entered, of which we had 10 withdraw within the last couple of days. The field of elites consists of a lot of up and coming talent in addition to men from the Army team from last year, as well as the women’s 4th, 6th, and 8th place finishers from last year. Most of the runners will be coming into town on Thursday, however at least 3 will be arriving Wednesday. Gate River Run Sponsorship Committee – Dennis Harrison reported that he and Doug Alred are planning to meet with CAA Sports after Gate River Run regarding sponsorship opportunities for next year, as they are currently working with the Rock & Roll race series. Community & Public Relations – Covered during Old Business (JTC Running Promotional video). Membership – Membership currently at 1,200. Communications: Newsletter, Social Media – The cutoff to submit an article or material for the next newsletter is the 10th, however if more time is needed, it would need to be in by the 15th for the latest cutoff date. Current newsletter is in the mail and the email blast has been sent. Stan Lambert added that he is currently working to partner with the Florida Striders to organize group outings for a Jacksonville Jumbo Shrimp baseball game and a Jacksonville Sharks arena football game, and more details would follow once he had some. He also discussed some details from several webinars and studies presented by Hootsuite on the status of social media regarding specific benefits, audiences, and effectiveness of platforms like Facebook, Instagram, and Snapchat. NEXT MEETING – The next board meeting will be Tuesday, April 2, at 6:30 pm in the Mediterrania Restaurant. The March meeting was adjourned at 7:49 pm.